Following onto my last post about station elimination and consolidation: The topic of transit signal priority comes up frequently when discussing improvements to the Green Line. It was prominently discussed at last month's Green Line meeting. I went and did some background research on it. Transit signal priority is the application of subtle changes to traffic light timing in order to assist the passage of transit vehicles. Broadly speaking, there are two categories: passive and active. Passive priority is static and predetermined: for example, changes to the timing of traffic light phases, or to the transit schedules. Active signal priority occurs dynamically, triggered as the system detects the approach of a transit vehicle. I will be focusing on active TSP. TSP should not be confused with "preemption" which is the abrupt interruption of normal traffic signal functioning. Preemption is used for safety purposes primarily: to assist emergency vehicles, or to clear a railroad grade crossing. The key difference is subtlety: traffic signal priority should be almost completely unnoticeable to observers. In the United States and Canada, over twenty agencies report using TSP, including but not limited to: Los Angeles Metro, Houston MTA, Sacramento RT, Pierce Transit (Tacoma), TriMet (Portland), SEPTA (Philadelphia), PVTA (Springfield, MA) and Calgary Transit. Some examples in other countries include: Zürich, Paris, London, Sheffield (UK), Amsterdam, Hannover (Germany), Sapporo and Curitiba (Brazil). The primary benefit of TSP is enhanced reliability of schedules: better maintenance of headways and less bunching. 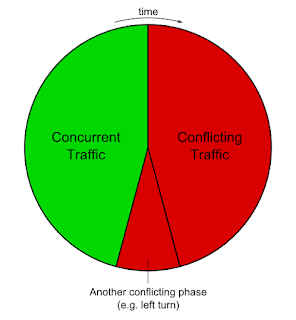 One of the biggest causes of variability is the unpredictable delay caused by traffic signals, compounded over the course of many intersections. TSP makes it possible to avoid the worst-case delay. A secondary benefit of TSP is a slight reduction in average trip time: less waiting at intersections. Another benefit is a potential reduction in operating costs for the route; saving money or boosting resources elsewhere. To see that, you must think about a transit route as a loop -- even linear routes must double back and return vehicles to their starting position somehow. 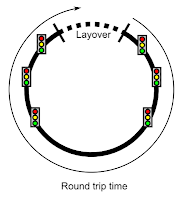 Normally, after a vehicle returns to the beginning, it is allowed to rest for a certain period of time called the "layover." The driver gets a break, or changes out. If the vehicle is running late, but not too late, then the layover is shortened in order to "recover" the schedule. Agencies build substantial "recovery time" into the layover time of a route, usually by tacking on a "padding" percentage of the round trip time. 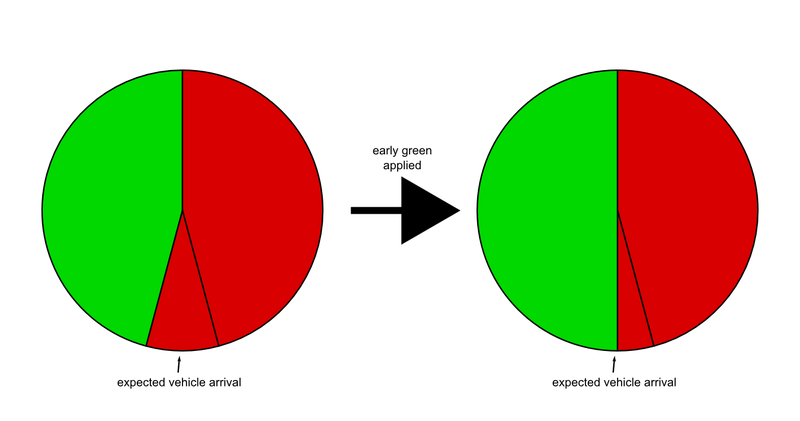 The percentage depends upon the reliability of the route: the goal is to minimize the probability that a vehicle finishes its round trip so late that it has exceeded the layover time allotted. So if TSP makes the route more reliable, then the layover time can be reduced. Whether through increased reliability, or reduced round trip time, if the overall time can be reduced by enough, then fewer vehicles and fewer drivers are needed to operate it -- a major cost savings. 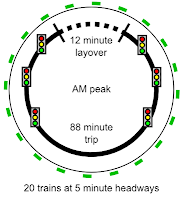 To give an example: the MBTA Blue Book 2010 reports that in morning rush hour the "B" branch of the Green Line requires 20 trains which are supposed to be spaced at 5 minute headways. This means that trains can leave Boston College over the course of 100 minutes until a returning train must be reused. The Blue Book also states that the scheduled time to reach Government Center is 45 minutes, and the scheduled return time is 43 minutes, for a scheduled round trip time of 88 minutes and a layover of 12 minutes. That implies a 13.6% padding. Now suppose that the padding could be reduced to 7% which happens to be the Swiss standard. That would imply a 6.2 minute layover, and at 5 minute headways, only 19 trains would be needed to provide morning rush hour service on the Boston College line. The NTD factsheet says that light rail costs $216/vehicle hour to operate here, so removing just that one train from just that one shift saves approximately $120,000 a year. Even if 7% is considered to be too little padding for other reasons, the combined travel time and layover time savings could easily add up to 5 minutes or more, producing the same operating cost reduction. And applied to all shifts you might even see savings add up to millions of dollars per year which can be put into other operating improvements. There are a few techniques that are generally applied to achieve active signal priority. Any combination of them may be deployed, depending on the conditions at each intersection. Vehicle detection methods must also be selected which are capable of providing enough notice of arrival to the traffic light controller. Such methods can be as simple as an induction loop in the ground, an optical sensor, or even information obtained from GPS satellites used to model the real-time schedule. Green extension keeps the signal green for a short while longer to allow a detected transit vehicle enough time to pass a light that was about to turn red. Early green hastens the expiration of the red light so that the detected transit vehicle can get moving as soon as possible. 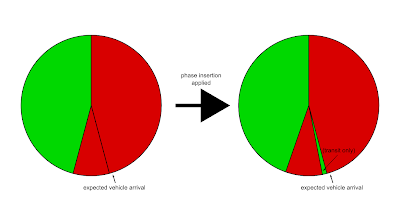 Phase insertion waits for the next moment in the cycle that all conflicting traffic is stopped and then takes a few seconds for a special "phase" which gives the detected transit vehicle an opportunity to proceed. Phase rotation changes the ordering of interchangeable phases so that the detected transit vehicle can proceed sooner rather than later. 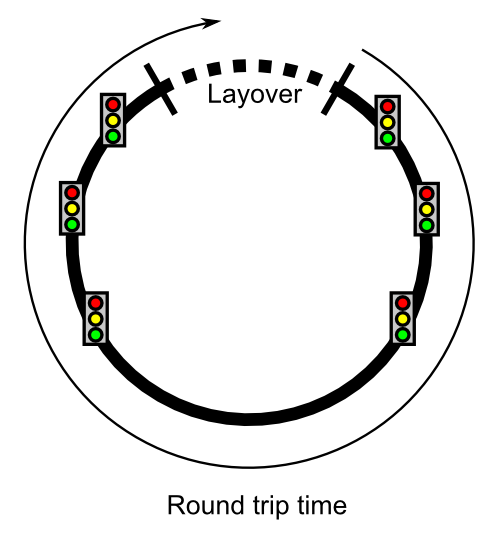 The best example is a left-turn-only phase which normally occurs before straight-through traffic goes: it can easily be "rotated" to occur after the straight-through phase instead. Deployment of TSP should be transparent to the typical road user. Unless they are looking closely, they shouldn't notice anything different; although some techniques are more obtrusive than others. 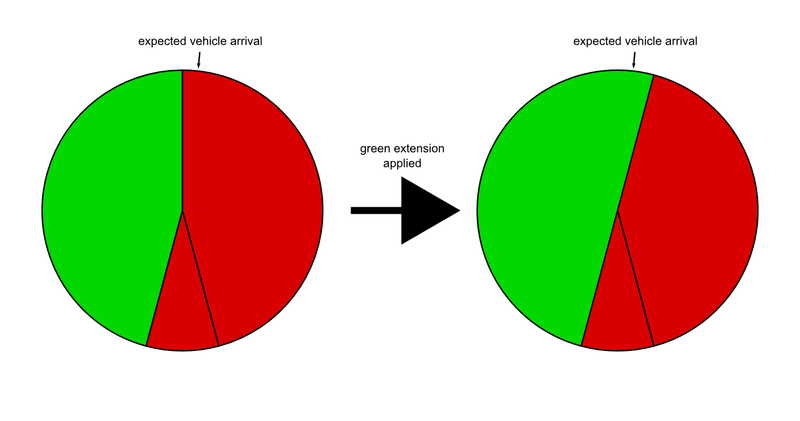 Green extension is probably the least noticeable intervention. On the other hand, early green has to allow enough time to safely clear the intersection: which can be difficult in the case of pedestrians. 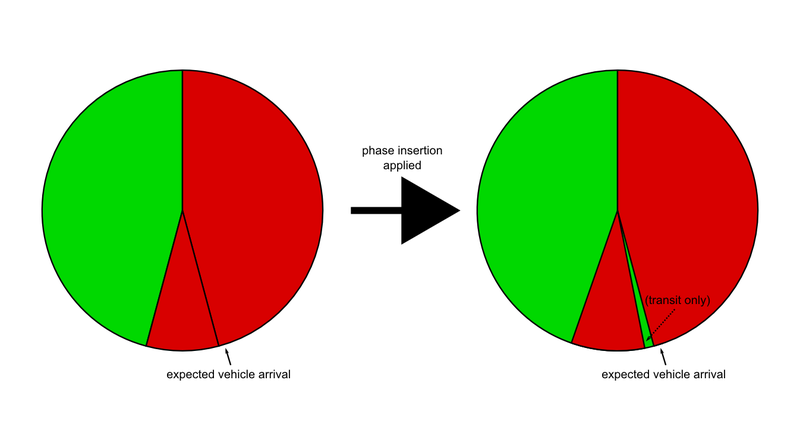 Phase insertion may be noticed by those waiting for the next phase, but it is a fairly short delay. Phase rotation may confuse those who have memorized the light patterns; but so would any change (Zürich chose to randomize such phases before implementing signal priority, to prepare the public in advance). The North American systems studied in-depth by the FTA did not find any significant delay experienced by the non-priority traffic, but systems in the past have failed due to improper planning, so it is important to study the design. However, even if there were significant delay to vehicles, that is not the correct metric to be using. Traffic engineers infamously use "level of service" to grade intersections by vehicle-seconds of delay even though this kind of thinking is notoriously unsuitable for city streets with many different kinds of users. Instead, transportation departments ought to be thinking about optimizing the safe "movement of people" instead of the "movement of vehicles." And in that respect, even if a signal priority system does cause some measurable delay to non-priority vehicles, it needs to be evaluated by the overall effect it has on people, not vehicles. 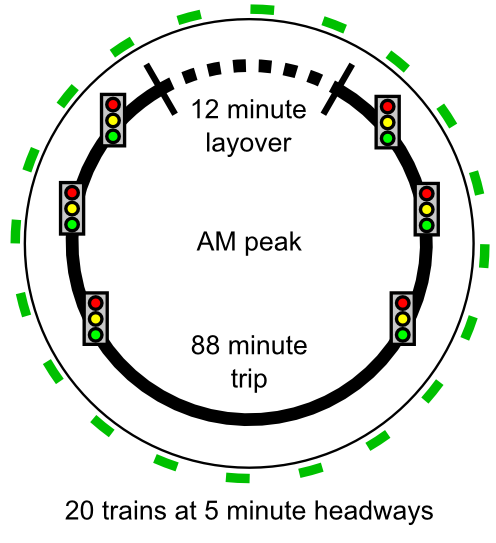 For example, suppose the installation of TSP at an intersection causes an average of 5 seconds additional delay to 36,000 non-priority vehicles, but also manages to reduce average delay by 15 seconds to the transit vehicles carrying 30,000 people a day. Assuming an occupancy rate of 1.2 persons per car, that's 216,000 person-seconds of delay to non-priority traffic. That sounds pretty significant until you realize that it is massively outweighed by the 450,000 person-seconds saved by the riders. And 36,000 non-priority vehicles is very high; in most cases along the Green Line the number is much, much less. A transportation department with its priorities straight would consider person-seconds the metric by which to optimize, not vehicle-seconds. And "level of service" is not a valid metric to use on city intersections because it does not make consideration for people, traveling in all modes, with or without vehicles.